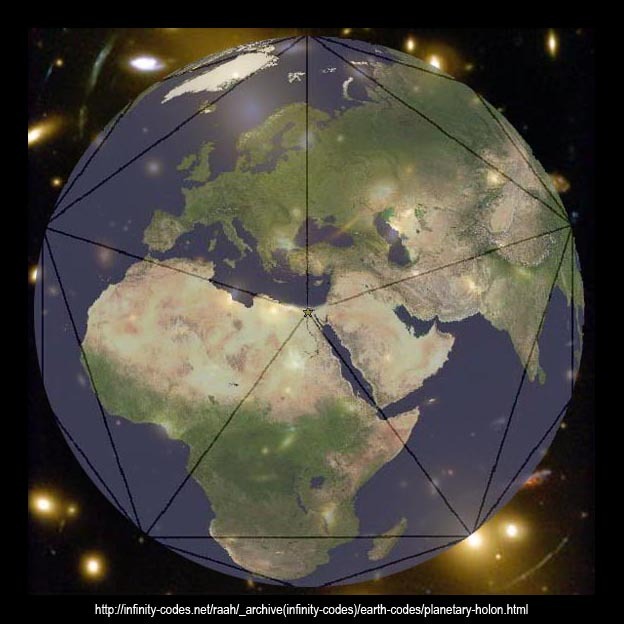 It is the subject of the Icosahedron that we shall focus upon in this investigation, and its relationship with the planet holon of the Dreamspell system. During my time studying the Dreamspell it has become apparent to me that there are some details that require revising. One main detail that requires revision is the shape of the Planet Holon. Below is a version I created to make this shift, I have kept the anchor point of the dragon and sun tribes, though I have used the ancient Egytpian city of Akhmim as the start point because it is right on 1 of the 12 Icosahedral vertices at 26.3 north, instead of with the Great Pyramid which is at 30 north (3.7 degrees off). 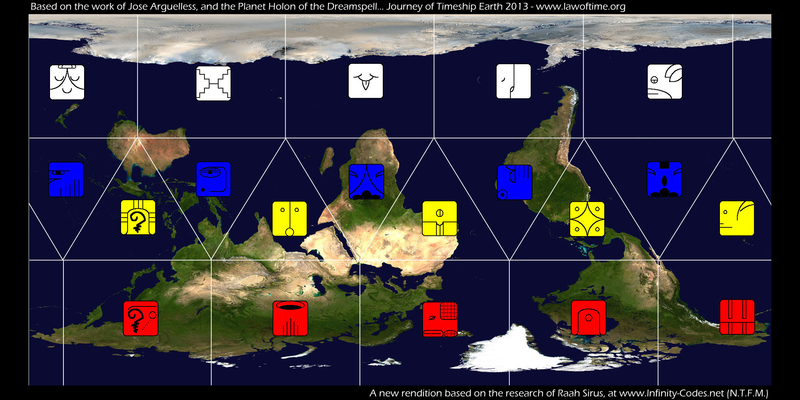 "At the moment of the primal dragon genesis, the four clans create the interdimensional structure of Timeship 2013, the icosahedron (1 of 5 perfect solids) of the planet holon." Each Bioregion now has as its shape a triangle rather than a square. The most northern and southern regions, are squares on the image as this is a flattened image of Planet Earth, which as we know is a sphere. In truth, the lines that point directly north and south actually meet together at the north and south poles respectively, and therefore the squares are actually triangles in disguise! The anchor point of the mythos of The Dreamspell is the New Year date of 26th July (Gregorian). This occurs every year in aligmment with the Solar Zenith (not always 26th of July) of the Sun at Teotihuacan & Edzna, Mexico. Whereas the Heliacal Rising of Sirius sometimes mentioned as also being on 26th July (*Is between 1900-2100 on 25th-26th July at 19.5 North), occurs at The Great Pyramid, Egypt, later in the year on 4th August (Gregorian) due to effect of precession over time. (*It was on 25th-26th July between 900-1000AD (page to be uploaded soon). This is an image of the Earth centred over the Great Pyramid of Egypt. 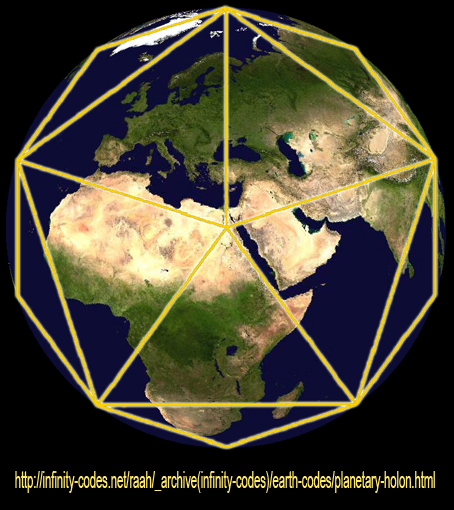 Overlaying it is an Icosahedron: one of the five primal shapes of creation. This Perfect Solid has twenty faces. Each face is an equilateral triangle; each has three edges of equal length.